It’s a bad habit, but I reach for my phone as soon as I awake to check email. 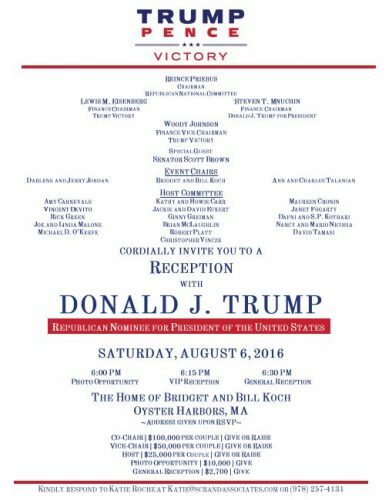 I was surprised to get an invitation to a Trump-Pence fundraiser. See above. I was surprised because the above invitation came from an acquaintance who is college-educated, very articulate, etc. And, he does a lot of work for the GOP. I was tempted to write back something snarky. I was tempted to throw stones. I was tempted to ignore the email with stony silence. But, I realized that my friend has the right to express free speech. He has the right to express why he is anti-Obama, which he did in an accompanying letter. And, I realized that I too have the right to free speech. So, I wrote back a very honest but polite email, which essentially said: I will never vote for Trump. On another note, it cannot be good for the GOP that an email for an event on August 6 went out on August 5. Even worse, the NY Times’ current forecast has the odds of a Trump win at 20%. Peggy Noonan nailed this election in her most recent WSJ opinion piece. As usual the ancient Greeks had the perfect word for our political situation and the implications for the US as a nation.